A story and teaching notes by Dr. Marvin Bartel, Ed.D. "How old are you?" "Four and three-quarters." Ella like every child her age was anxious to be five years old. Ella and Grandpa were sitting together on the floor next to a low bench. On one end of the bench Grandpa had placed a potted orchid with seven blossoms. He had brought some paper and a soft lead drawing pencil. Ella and Grandpa were eating cookies. Ella had some milk and grandpa had some coffee. They were drinking from cups Grandpa had made in his pottery shop. Ella liked to sit on the floor. Grandpa thought it was okay, but it was sort of hard to get up. Ella's grandfather often thinks about how young children learn. Thirty years ago he had done his graduate work in art education. He knew the research, the assumptions about the developmental stages, and thinking styles of young children. Grandpa knew that many children become stymied in their drawing ability because adults drew for them rather than helping them learn to draw. Few adults understand how to teach drawing to a young child. Grandpa knew that young children draw without any instruction. But, he also knew that many young children had become uninterested in drawing or afraid to draw because "helpful" adults had discouraged their natural inclinations to draw and learn from the practice. Adults often draw for children and expect the children to imitate their drawings. This seldom works. Young children make very inferior copies. Both the child and adult give up in frustration. They excuse themselves - assuming that drawing is a talent rather than a way of thinking and seeing that is developed through practice.Well meaning adults who expect imitation are expecting exactly the wrong thing. The right thing is for the child to attend to her/his own experience with the thing being drawn. Learning to attend to an adult's drawing distracts from the learning task and produces dependency and limits brain development. Drawing is not an innate talent - it is a skill of the brain that is nurtured through practice in attending to the thing being drawn - not an adult's drawing of it. Art educators find that most children stop drawing entirely as they reach age eight or ten. By this age they have become aware of how "stupid" and "childish" their drawings look. These "baby talk" drawings are too embarrassing. Grandpa thinks that if we taught reading and writing as poorly as we teach drawing, about 10 or 20 percent the adult population would be literate. Grandpa shares this story as insight into how we need to change the way drawing is taught to children. Please continue reading. "I'm glad you helped Grandma make these cookies. Aren't they good?" "Yes!" Ella replied. Grandpa continued, "This is really a beautiful orchid. I noticed yesterday that you were giving it some water. How long have you had this orchid?" "Since I was born." Ella replied. "Wow, that's amazing. When I get an orchid, it blooms for a few months, then the leaves start to get yellow and pretty soon we just have to toss it out." "Who takes care of this orchid to keep it so nice?" "Just me. I water it." Ella replied. "Do you water it every day?" "No." "How do you know when to water it?" "When the dirt feels dry." "Well, the orchid must really like it. It sure has lots of flowers." "How many flowers does it have?" Ella begins pointing to each flower while saying the numbers from one to seven. Grandpa exclaims, "Wow, seven blossoms!" Grandpa continued to talk about the orchid to get Ella to see more parts of it. "Did you notice these silly roots? This orchid has a whole bunch of roots that are up in air. I thought just the branches and leaves were supposed to be in the air. Why do you think it has roots in the air?" "I don't know" Ella responds. Grandpa says, "I don't know either, but I think the roots really look sort of funny." Grandpa continues, "Shall we see if you can draw a picture of just one these roots. You pick one of the roots that you like and I will teach you how you can learn to draw it. Which root looks interesting or silly to you." Ella points to a root that is about 5 inches long that arches up from the plant and then goes horizontally for two inches and dips down again. Ella is anxious to start drawing and picks up her pencil. Grandpa says, "Just a minute, I want to look at this silly root before you draw it. Watch my finger how it slides along the top of the root slowly from one end to the other. Could you slide your finger along the root and see how the line first sort of slants up. Then which way does it go?" Ella says, "It turns a little and still goes up." "That's right!" says Grandpa. "Then which way does it go?" Ella says, "Then it tips a little bit." "Okay! That's right" responds Grandpa. Next grandpa says, "Now I will go back a little ways and just point to the root with my pencil, but I am too far away to actually touch the root. Now watch me move the pencil in the air while I pretend to slowly draw the root in the air." Ella watches. Grandpa says, "Now you can slowly draw with your pencil in the air to practice making the shape of the root." Ella practices it by pointing her pencil to the root and draws it in the air. Grandpa watches and says, "That was good! Now practice it in air one more time, but this time do it really slowly so your pencil can follow the shape easier." Ella practices again. Grandpa says, "I bet you could show me on the paper how root is shaped. Where do think the root should start so it fits on the paper? Ella points out a spot on the paper and Grandpa says, Good, now you can draw it on the paper. While you are drawing, you can stop and practice in the air anytime you are wondering how to draw the next thing. Just stop drawing and look back at the orchid and it will show you how it looks." 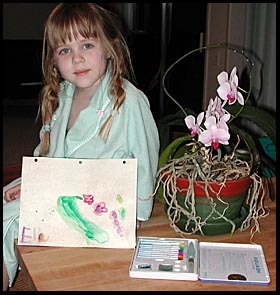 Ella, age four and three quarters, proceeds to draw the root, the leaves, the sweeping blossom stock and the 7 orchids and buds more or less from observation. Grandpa sits in amazement and wonders if he will be able to get up from the floor. Ella's pencil drawing of an orchid. The original is about 8 inches wide. 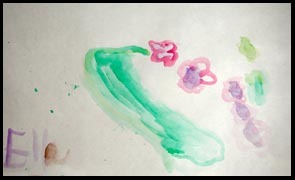 Click here for her watercolor painting of the same plant. Sequence: The single root was first. Then the bottom leaf and the top leaf. Thirdly, she added the blossom stem. The blossoms and the buds were last. When you watch children draw flowers, what do they draw first? How much to they add? Why do you think I zeroed in on the silly root rather than the orchid flower? I assume that every child's brain already has a picture of a flower ready to draw. This is an obstacle when teaching perception. The part of our brain that learns how to make careful observations does not develop if draw from what our brain thinks that it already knows about how things look. New observations are blocked or overlooked because of these preconceptions. I look for subject matter that the brain has not yet stereotyped and cataloged. Therefore, I often select the mundane, the trivial, the little details, from the child's ordinary experiences. When I talk about this to adults, I say that in order to learn to draw we have to see the world without prejudice - as God sees. When teaching perception, it easier if we select subjects that are new and unfamiliar (not yet learned). That is why the root and not the flower was used. A familiar thing like a well loved toy animal can be made to look unfamiliar by turning it upside down, backwards, etc. When teaching perception it is important to select something that is easy enough to avoid frustration. That is why only one root was selected in this story. Had Ella stopped after the one root, that would have been fine. It must be challenging enough require some detailed study and concentrated practice in the air. Using both touch and vision is more perceptual than using only vision. That is why a simple square thing, or a simple round thing like a ball, is not very useful. The thing observed has to be unexpected enough in some way so that careful looking is required. Avoid things for which the child's brain has already created and stored a stereotyped image. When teaching perception it is helpful to select subjects that are emotionally important to the person doing the drawing. When I teach I ask children if they can guess why I picked the subject that was picked. I explain the above principles to children so they can use the principles themselves when they practice. sketch it in the air. As the teacher, I did no drawing in this drawing lesson. I draw the line on this. When the teacher begins to draw, the child will stop looking at the real source and begin looking at the adults replica of the source. This is not learning to see. This develops a common problem among children. We call it learned helplessness. Ella had no chance to copy my drawing. Ella had to get her visual data from the orchid root itself. She was learning to be self-sufficient - not dependent and helpless. I showed observation methods. I never corrected Ella and took every opportunity to affirm and encourage her efforts. Young children respond positively to positive motivation. Negative motivation may work to stop something, but it does not work to promote something positive. In subsequent lessons I have shown Ella how to use a "blinder" on her pencil. A blinder is an 8 x 8 inch piece of heavy paper with a small hole in the middle. Her pencil is placed in the hole. The blinder hides her paper while she draws a new thing. This keeps her eyes on the subject instead of the paper. At age six when Ella wants to draw a new thing she puts the blinder on her pencil and makes practice drawings on her paper. Often this ends up to be a jumble of lines, but the individual lines are amazingly faithful to their sources. After this "seeing practice" she takes the blinder off her pencil and makes another drawing while looking at her paper and at the subject. At age six, Ella reads well and enjoys leaning to add two digit numbers. Teachers are good at teaching reading, writing, math, and so on. However, most children have no art teachers that bother to teach them art. Too often their art is mainly offered as relaxation. Some teachers give them busywork projects. The busywork is made up of prescribed pictures, tracing, or craft projects that are largely pre designed. Other teachers simply allow them play around and do whatever they wish. If I were to choose, I would rather see the 'play around' method than the 'cute craft project' busywork. While these activities are not immediately harmful, they do leave a gap in their education and mental development. In many schools art is taught so poorly in the younger years that most children feel totally incompetent by the time they reach grade three. Only the few who have practiced more excel. Often the 'talented' ones have parents who are particularly generous with materials and encouragement. These children are called the 'talented artists' in the class. The remainder of the class suffer from what is called a "crisis of confidence". They stop practicing because nobody ever helped them learn how to trust their own perception and practice productively. Schools in Japan are faulted by some because their culture honors the group more than we do at the expense of the individual. Children that are particularly gifted and creative are discouraged from being different. "If the nail sticks out, hit it down." is a common saying. This has both positive and negative educational and societal outcomes. While individual creativity may suffer, the ability to create and produce high quality in groups may be stronger. On the following day after Ella did the pencil drawing at four and three-quarters, feeling confident in her ability and self-sufficient, Ella decided that she would try out a set of watercolors that her great grandmother, age 94, brought her from Japan. SHOULD ALL THEIR DRAWING BE FROM OBSERVATION? No. In addition to direct observations, other good sources of content for children's drawings include, their imaginations (another important area of brain development), their everyday experiences, their memories, and special events (both good and bad) in their lives (important for emotional development). We motivate children to elaborate more more in their drawings by asking them open questions that bring to mind ideas from their own experiences - not by drawing for them. We give positive feedback about their work. We provide unlimited paper or a white board (with non-toxic markers). We treat the artwork as a gift no matter how it looks. When we fail to understand we do not say, "What is it?" We say, "Can you tell me more about this?" Young children are not corrected in their drawing. If young children are corrected in their drawing, they will automatically move to a less beneficial activity such as watching cartoons on TV, or some other brain shrinking activity. All rights reserved. Photographs, text, and design © Marvin Bartel and bartelart.com. 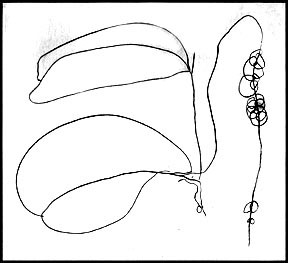 How to Draw and Orchid (poem) is © David Wright 2003. Ella's work is her property and may not be published without permission from her parents. Parents, care-givers, pre-school teachers, and art teachers may make one copy for personal study. Permission is required to make any other copies, to publish, or to post on another web site. Please mention the URL or the title of this page in your correspondence with the author. You may make a link to this page from your page without permission, but you may not post this page or any photos from this page on another web page without permission. Your correspondence, experiences, ideas, and questions are welcome.